Mary’s song from Luke 1:46 – 55 is also known as the first ever Christmas song, and is a great piece of exaltation and prayer. It isn’t a simple song of thanksgiving from an ordinary woman, for makes a point about God’s role in economics, in society and in morality; and links the history of the Israelites to the prophecy that is happening. Yet in today’s study we won’t be looking at anything too complex, but something simple and straightforward – the pure, simple joy of Mary’s prior to the birth of her son, Jesus Christ. In the entire song, Mary simply expresses her deep adoration and gratefulness, speaking of how privileged she feels and the wonderment that she has been chosen. It was the highest kind of verbal praise possible from a person, and it reflected Mary’s frame of mind at that time – great, unadulterated joy. Yet she was in a situation that perhaps would have stumbled a great many others if they were in her shoes. If she had simply chosen to focus on the fact that she was pregnant as an unwed woman, and the potential repercussions that she may have to face due to her people and culture, it wouldn’t have been strange if Mary’s song and prayer to God was a more heart-wrenching cry for help. In this study, using Mary as a case study, we will be looking into how we can focus on the Lord – who brings us true joy – even in potentially dangerous circumstances. my spirit – let’s take a look at Mary – who was very much an ordinary woman in all aspects – if you were from that era, she could have been your neighbour! When we talk about major female Biblical characters and their feats, Mary would often be the first name to come up – but more often than not, we know more about her son’s feats than of what she had done. Sure, she had borne us Jesus Christ. But in comparison to the likes of Esther and Ruth, who had entire books in the Bible devoted to them; or the wives of the patriarchs of Israel: Sarah, Rebekah, Rachel, whom we are familiar with through the stories of their family – sometimes it feels like we weren’t told too much about Mary. Indeed, her screen-time in the Bible more or less disappeared after the birth of Christ and we only read about her again during the crucifixion [John 19:25]. Yet, the first chapter of Luke alone gives us great insight to the character of this woman. 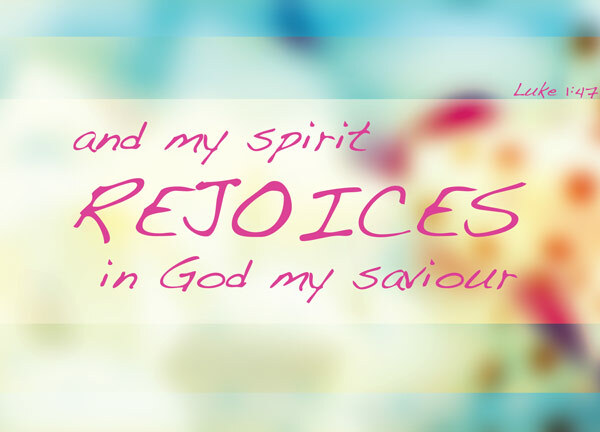 She didn’t just say, “I am very happy!” – as we today probably would have; she didn’t just say “I rejoice in God my saviour!” – instead, her soul exalts the Lord [Luke 1:46] and her spirit rejoices in God. It shows us he single-mindedness about God – no worries about her strange situation, no concerns about anything else, but she fully indulged in the joy that God has granted her. And great is God, that we need to exalt him with our soul. Great is the joy that comes from the Lord, that even our spirit – our entire being – can rejoice. rejoices – the term used in this verse to give us a measure of Mary’s joy was ‘rejoice’, and the original word is ‘Agalliao‘. I don’t speak Greek, but I found this interesting enough – appearing 11 times in the New Testament, Agalliao means to exult, to rejoice exceedingly, or be exceedingly glad. Now, I love the expression of ‘exceeding joy’, and I find it best summed up in Psalm 43:4 – Then will I go unto the altar of God, unto God my exceeding joy: yea, upon the harp will I praise thee, O God my God [Psalm 43:4|Article]. God is our source of joy – but in him there’s not just joy, but there’s boundless, overwhelming and exceeding amount of joy. A joy that cannot be described with words, a joy that cannot be contained. Here’s another instance the term ‘agalliao’ is used – Though you have not seen him, you love him; and even though you do not see him now, you believe in him and are filled with an inexpressible and glorious joy [1 Peter 1:8] – again, here to express the great, inexpressible joy that comes from knowing God. Do you have agalliao in your life right now? Do you have reason to be exceedingly joyful? Have you ever experienced a state of agalliao? Sometimes, you can be joyful not because something good happened to you. Many times, you will lose something, but if you choose to look for the joy that is ahead of you, you will be able to see that you will gain something greater, and thus, you can rejoice despite your circumstances. To many people, perhaps the most important thing in life is to be happy. That’s perfectly legitimate, whether you are a Christian or not. In fact, most of us spend a great majority of our lives looking for joy, which often escapes us. I’d like to think that no matter the time, no matter the place, no matter the circumstance, God remains a source of joy – a boundless source of joy, a constant source of great joy. No matter how bad our plight is in life, God is still there, and because he is still there, because of the hope that we have in him, because of who he is, we have great reason to rejoice exceedingly. A kind of rejoicing that doesn’t hold back anything, a kind of delight that isn’t affected by any other thoughts. Just like how Mary singularly looked at the joy that was ahead of her.